The parish of San Lorenzo Ruiz in Navotas (Metro Manila), the Philippines is a Dominican parish serving the urban poor and fishermen of this area by the sea. Over the last six years it has laboured to build a new church with a larger capacity and elevated to avoid the frequent floods that strike the neighbourhood. This is the view, looking towards the north transept. We often hear that we have to choose between beauty in our Liturgy and feeding the poor and homeless. 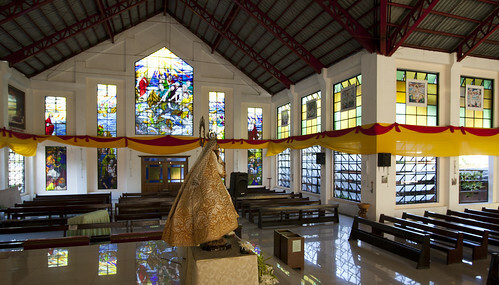 But this new church of St Lawrence Ruiz in the slums of Navotas, where I worked for a year and from which I took my religious name, is a reminder that the poor deserve and desire beauty for the glory of God, and to raise their spirits.